Review: We were mighty impressed by Milanese party posse Rollover's first "anything goes" edits release, which promptly came and went from stores in a matter of days earlier in the year. Happily, this follow-up is similarly impressive. 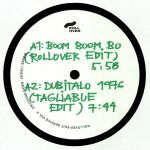 Opening edit, "Boom Boom Bo", a gentle mid-tempo house tweak of a smooth, horn-sporting jazz-funk number, sets the tone, before Tagliabue impresses via the Afro-Cosmic chug and subtle Balearic tones of "Dubitalo 1976". Etna is next up, rearranging and remixing a bongo-laden tropical bubbler from the early 1980s, before headline guests SHMLSS slap on some eyeliner and turn a New Romantic gem into a sweaty chunk of rubbery dub disco goodness.